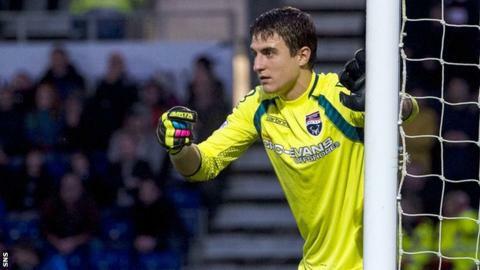 Hibernian have signed their second goalkeeper in a week with the capture of former Ross County, Kilmarnock and Inverness Caledonian Thistle man Antonio Reguero on a one-year deal. Reguero, 33, will battle for a first-team spot with Mark Oxley, who signed a two-year deal last week. He told the Hibernian website: "This is a great move for me. "I've really enjoyed the last three years in Scotland and I'm very pleased with my move to Hibernian." The Spaniard has joined the rest of the squad at their training camp in La Manga. "The club face a big challenge next season and I'm looking forward of being part of our bid for promotion," he added. Manager Alan Stubbs also has Keith Watson training with the squad as he considers a move for the 25-year-old former Dundee United full-back, who ended last season on loan at Easter Road. The Leith club have already signed Martin Boyle, Dan Carmichael and James Keatings on permanent contracts.